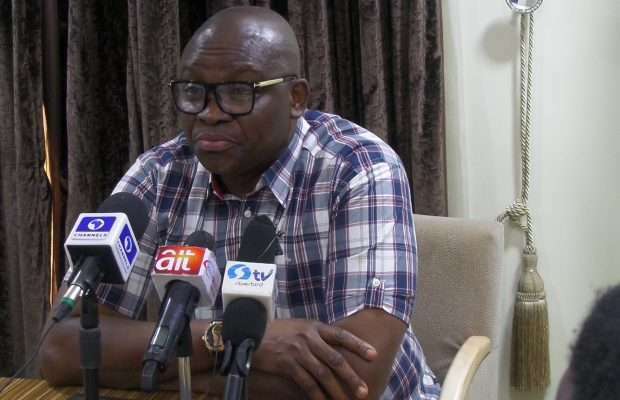 Ekiti State Governor, Ayodele Fayose, has asked President Muhammadu Buhari to resign over the “nonchalant attitude ” of the Federal Government towards ending the fuel scarcity being experienced across the country . The governor said it was unfortunate that the fuel scarcity was biting harder under the watch of the president as the Minister of Petroleum . He maintained that the All Progressives Congress -led federal government was punishing Nigerians with fuel scarcity so as to achieve its planned raise of petrol pump price from N 145 to not less than N 185 per litre . The governor stated these in a press release issued on Friday by his Special Assistant on Public Communications and New Media , Lere Olayinka. In Ado Ekiti , there were long queues in Bovas filling stations in Adebayo and Bank roads as well as the Nigerian National Petroleum Corporation mega station on Iworoko Road. Fayose said , “Already , fuel is being sold officially at between N 180 and N 200 at petrol stations across the country . “ It is sad that this Buhari ’ s APC government had to choose this Christmas and New Year period to ground Nigeria with the fuel scarcity that it deliberately orchestrated . “ Like I said a few days ago , what the federal government is doing is to create scarcity so that Nigerians will be willing to buy at any price , provided the product is made available.